In the field of happiness economics, there is limited literature on the influence of places on subjective well-being. Much of the research on the determinants of happiness have focused on individual or life circumstances such as income, health, family and social life, and work while environmental factors relating to the spatial and built environment are less common. There is a growing number of studies which have shown that characteristics of places have an impact on people’s well-being but the empirical evidence is still scarce particularly in cities where the physical environment is a ubiquitous part of life. 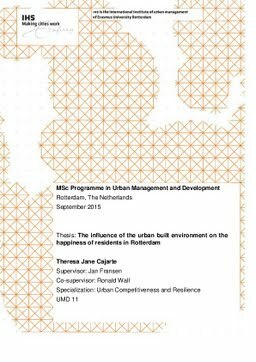 The main objective of this research is to determine the characteristics of the built environment that significantly affect city residents’ happiness, life satisfaction and satisfaction in different urban life domains. The role of urban life domains in predicting subjective well-being is also examined. The research used the bottom-up model on life satisfaction and satisfaction from the urban life domains of housing, neighbourhood and the city to predict subjective well-being. The mediating role of urban life domains was also studied to better understand the effect of the built environment on subjective well-being. A survey was conducted in two types of neighbourhoods in the city of Rotterdam, one in a highly built-up area and another in a less built-up area. Secondary data was also gathered from official sources. The data was analyzed through multiple ordered probit regressions following Baron and Kenny’s (1986) approach to mediation analysis. The research provides empirical evidence that the built environment has a direct effect and can predict happiness and life satisfaction as well as satisfaction in urban life domains. The built environment characteristics that were found to be significant to both happiness and life satisfaction are house size satisfaction, estimated travel time from home to work, access to parks and green areas in the neighbourhood, access to medical facilities in the neighbourhood, access to sports facilities in the neighbourhood, satisfaction with city education services and city traffic perception. Thesis Advisor Fransen, J., Wall, R.